All interactions written by a volunteer in Volunteer by EverTrue (web or mobile) will be captured for your organization to use in EverTrue and export for your records. Open your user menu in the upper-right corner and go to "Settings." Go to the "Export Data" tab where you'll find the Volunteer Interactions export. 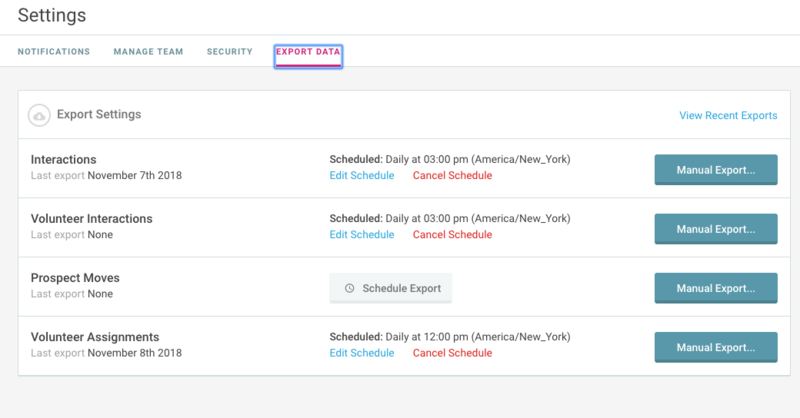 From here, you can choose to run a manual export and select your timeframe, or schedule a daily export via SFTP. Your Volunteer Interactions will be exported as a standard CSV file. A sample file can be found here. Please note that your export format may differ based on the settings enabled for your institution. All Volunteer Interactions will be marked as one of the following types: Volunteer Text Message, Volunteer Phonecall, Volunteer Social, Volunteer Email, Volunteer Note. InteractionImportId - Not currently in use. This will always be a blank column. InteractionEverTrueId - EverTrue assigns an ID to interactions written by your volunteers in our system. This value is useful if you are hoping to import these interactions to your database. ConstituentImportId - This is your ID for the constituent the interaction is associated with. ConstituentEverTrueId - This is EverTrue's internal ID for your constituents. This is not important for you to retain. InteractionType - The type of interaction selected by your volunteer. The only possible values are Volunteer Text Message, Volunteer Phonecall, Volunteer Social, Volunteer Email, Volunteer Note. This column will never be blank. CreatorUserImportId - Not currently in use. This will always be a blank column. CreatorUserEverTrueId - The EverTrue ID of the person who wrote the interaction. ProposalImportId - Not currently in use. This will always be a blank column. ProposalEverTrueId - Not currently in use. This will always be a blank column. AuthorName - First name + last name of author (this will always be the same as the Volunteer Name). AuthorImportId - This will likely not be populated with values unless the author of the volunteer interaction is also a solicitor at the institution. AuthorEverTrueId - EverTrue's internal UserID for the author. Summary - The summary of the interaction entered by the volunteer. Text - The body of the interaction entered by the volunteer. DateOccurred - The date the of the interaction, chosen by the volunteer (in local time). CreatedAt - The date and time the interaction was created (created by the Volunteer system in local time). UpdatedAt - The date and time the interaction was last edited. Initially, this will be the same as CreatedAt field in local time. VolunteerEvertrueId - EverTrue's internal ConstituentID of the volunteer. VolunteerImportId - Your institution's ID for the volunteer. VolunteerPoolName - The name of the pool that the prospect was in when the interaction was written.